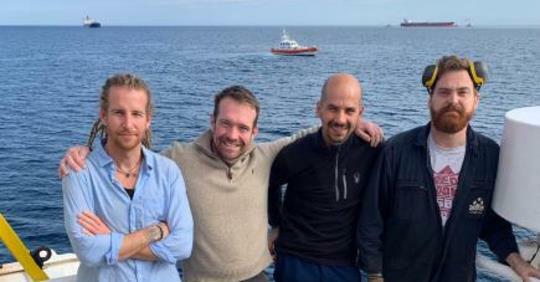 Four British rescuers stranded off Sicily while facing an investigation for supposedly assisting illegal migration have called on the Foreign Secretary to intervene to free them and the 47 people they saved from the sea. The crew of Sea-Watch 3 rescued the desperate men and boys from the Mediterranean as their inflatable vessel was losing air, and were allowed to shelter offshore from Syracuse, Sicily, from storms. But they said they have been prevented from leaving the boat, or local waters, while they are being investigated after a call from Italian interior minister Matteo Salvini. The right-wing leader has refused to let private rescue boats enter the country’s ports, arguing they encourage human traffickers on the Mediterranean. Father-of-two Brendan Woodhouse, from near Matlock in Derbyshire, is among the British crew members. He spoke of being “imprisoned around Sicily” as he called for Jeremy Hunt’s help. “We are not allowed to land, nor are we allowed to leave, nor is the ship allowed to sail away,” the firefighter told the Press Association. He continued: “We would ask Jeremy Hunt to apply some pressure on the Italian authorities to accept 47 people on board and allow the crew to leave. Mr Woodhouse, a 42-year-old former British Army reservist, said he missed his scheduled flight on Monday ahead of his return to work at Nottinghamshire Fire and Rescue Service. Mr Salvini has accused the captain and crew of “a crime and a clear desire to use these immigrants in a political battle” and said evidence will be handed to judicial authorities. “The interior minister is gathering elements to evaluate whether to press charges against the entire Sea-Watch crew for favouring illegal immigration,” the ministry reportedly added. The crew from the humanitarian aid vessel said they rescued the migrants, including 15 unaccompanied minors, on January 19 after they were spotted off Libya by a passing plane. Sea-Watch 3 said they were not granted permission to land by Malta before the Italian coast guard said on Friday they could shelter in its waters from a storm. Head of mission Kim Heaton-Heather, 37, originally from Brighton, also called on Mr Hunt to extend his support and end their ordeal. He said: “If he had seen people lying upside down in the water outside the ship, if he had heard people talk about torture and seeing family members killed and heard stories about all the people drowning, I don’t think any human being could turn their back on this situation. Also on the vessel are chief engineer Jon Stone, a 32-year-old former Navy serviceman from Lincoln, and bosun Dan Bebawi, 39, formally a car mechanic in Nottingham. The situation is becoming dire on board, with two of their three portable toilets full up and provisions running low. Sicilians have offered their support and three United Nations agencies have appealed to Italy to allow the migrants off the ship. And while the mayors of Naples and Palermo have offered their ports, the jurisdiction lies with national authorities. “Every day that we are held here is another day we are not able to search and rescue people. Every day we are not there, people are dying,” Mr Heaton-Heather said. Please sign the petition to open the ports!